Home Yu-Gi-Oh! Yu-Gi-Oh! News NEW from Yu-Gi-Oh! TCG in April 2019! NEW from Yu-Gi-Oh! TCG in April 2019! Launching today, April 3, Duel Power is an elite collection of 100 Ultra Rares that include 40 brand-new cards destined to shake up every level of competition, plus 60 of the strongest and most sought-after cards in Dueling today. Each Duel Power collector’s set comes fully loaded with six Duel Power booster packs with 5 Ultra Rare cards per pack. Hitting shelves on April 5, the Golden Duelist Collection Duelist Portfolio, which includes 10 pages with 9 card pockets per page, features an exclusive glittering foil finish, unique to the Golden Duelist Collection. On April 19, Duelists will be able to get their hands on Structure Deck: Order of the Spellcasters, loaded with all the arcane opportunities they’ll need to mount their magical conquest! Structure Deck: Order of the Spellcasters will include 1 Beginner’s Guide, 1 Double-sided Deluxe Game Mat/Dueling Guide, and 42 cards total: 37 Commons, 3 Super Rares, and 2 Ultra Rares. El Segundo, Calif. (April 3, 2019) – Your favorite Decks are about to get better this Spring in the Yu-Gi-Oh! TRADING CARD GAME (TCG), as time-honored themes are reinvented and modern classics reach new heights. Konami Digital Entertainment, Inc. (KONAMI) is excited to usher in bright new futures for fan-favorite strategies from the past and present. It all starts with the Duel Power collector’s set, ramping up the action with loads of amazing new cards, and levelling the playing field with awesome reprints. Duel Power heralds the debut of stunning new Link Monsters like Platinum Gadget, Aromaseraphy Jasmine, Crowley, the First Propheseer, and Thunder Dragon Thunderstormech, introducing theme-stamped Link Summons to strategies that didn’t have their own Link Monsters before. And if that wasn’t enough, flexible new Link Monsters like Beat Cop from the Underworld and Security Dragon bring new combos and control moves to a cadre of different Decks. The Duel Power collector’s set is one of the most anticipated releases of the year: an elite collection of 100 Ultra Rares that include 40 brand-new cards destined to shake up every level of competition, plus 60 of the strongest and most sought-after cards in Dueling today. Each Duel Power collector’s set includes six Duel Power booster packs with 5 Ultra Rare cards per pack. And fans of the Yu-Gi-Oh! TV series will find something special in every Duel Power collector’s set: Ultra Rare variants of all six ace monsters from every generation of Dueling, from Dark Magician to Decode Talker, each with stunning new artwork. Every Duel Power booster pack is loaded with cards to strengthen your Deck-building arsenal. Tournament mainstays like Infinite Impermanence, Evenly Matched, and Card of Demise return in all their Duel-dominating glory, “discard” Effect Monsters like Ghost Ogre & Snow Rabbit and Ghost Belle & Haunted Mansion make encore appearances, and even Extra Deck powerhouses like Trickstar Holly Angel, Naturia Beast, and the stunning Borreload Dragon are back. Joining the past with the present, Duel Power also re-envisions some of the most famous cards in Dueling history. Yugi’s Dark Magician is reborn as the Ritual Monster Magician of Chaos, Zane’s Cyber Dragon strategy gets supercharged with Cyber Dragon Nachster, and Signal Warrior celebrates the Duel Wheeling heroes of Yu-Gi-Oh! 5D’s. Yuma’s Number 39: Utopia reemerges as Number 39: Utopia Double, and Odd-Eyes Advance Dragon erupts from Yu-Gi-Oh! ARC-V to burn through your opponent’s monsters and Life Points. Meanwhile some of the biggest Decks from Yu-Gi-Oh! VRAINS continue their reign with new cards like Gouki Cage Match and Trickstar Foxglove Witch. The Duel Power collector’s set launches on April 3 with 6 new Ultra Rare variant cards in every box, plus 6 Duel Power booster packs with 5 Ultra Rare cards each. 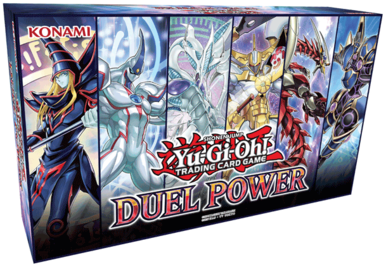 The Duel Power booster set consists of 100 Ultra Rares total: 60 Ultra Rare reprints and 40 all-new Ultra Rares. MSRP: $29.99 per set. 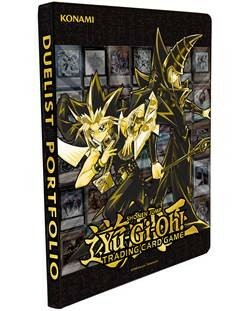 The Golden Duelist Collection Duelist Portfolio arrives April 5, and includes 10 pages with 9 card pockets per page, displaying up to 180 cards. MSRP: $9.99 per Portfolio. From there the season turns to the ancient and arcane, as some of Dueling’s greatest sorcerers and spellcasters return to claim their rightful place. Structure Deck: Order of the Spellcasters assembles a cast of classic conjurers and imbues them all with a new form of trickery: abilities that let them change from powerful monsters into raw magic and back again. Fan-favorites return as Pendulum Monsters, capable of leaping in and out of your Spell and Trap Zones with surprising Special Summon effects, all powered by the “Spell Counter” mechanic. 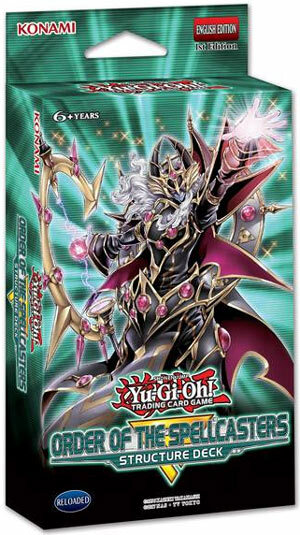 Endymion, the Master Magician makes a revolutionary return, demolishing the field when he arrives and negating your opponent’s Spells and Traps. The new leader of the Magical City uses Spell Counters as sorcerous shields to protect himself from targeting and destruction, and should he ever be destroyed you’ll search any Normal Spell card you want, straight from your Deck. Endymion’s acolytes are all fierce Pendulum Monsters that Special Summon not only themselves, but more support from your hand, Main, and Extra Deck. A new Link Monster joins the battle to make even bigger plays, turning your Spell Counters into raw destructive power while new Spell Cards let you search and reuse your most powerful Spellcasters (all while helping you gather more Spell Counters). Combined with popular Spell Cards like Left Arm Offering, Spellbook of Secrets, and the peerless Pot of Desires, Structure Deck: Order of the Spellcasters is loaded with all the arcane opportunities you need to mount your magical conquest. Structure Deck: Order of the Spellcasters is available April 19 with 1 Beginner’s Guide, 1 Double-sided Deluxe Game Mat/Dueling Guide, and 42 cards total: 37 Commons, 3 Super Rares, and 2 Ultra Rares. MSRP: $9.99 per box.